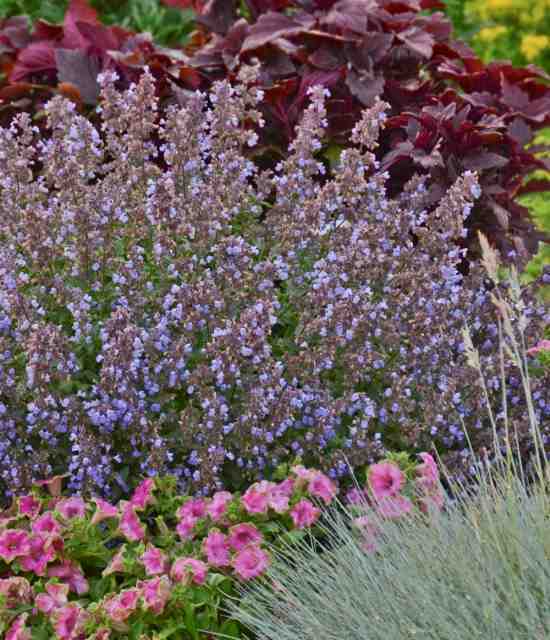 On a recent growers tour which included the test gardens for Proven Winners Perennials as well as Walters Gardens, the biggest grower of perennials in North America two lovely Nepatas caught my eye. Both are great additions to the landscape. I have always loved Nepata 'Walker's Low' for its toughness and colour but it is floppy in habit and awkward to situate in the garden. Hybridizers managed to reduce the size of Walkers Low but keep all the great attributes with 'Junior Walker'. 'Purssian Blue' is an exclusive introduction from Walters Gardens. It produces masses of periwinkle blue flowers with dark purple calyxes and blooms for several months. It grows quickly nearly doubling in size in two years. Both Nepatas are ideal to use for edging a rose garden or daylily border. The colour will combine beautifully with any other sun loving perennial. Nepatas are deer and rabbit resistance and attract butterflies and other pollinators to the garden. What more could you ask for?